Should you move to Duluth, MN? Huttner is right to point out that winter weather in Duluth remains brutally cold, snowy and difficult. But it is changing, and it’s changing faster than many other places. Winters are now five degrees warmer than they were in 1970, according to NOAA data analyzed by Climate Central. The Weather Channel isn’t the only one praising Duluth as a future place to live. The NYT article Want to Escape Global Warming? These Cities Promise Cool Relief by Kendra Pierre-Louis (4/15/19) lists Duluth and Buffalo as cities of the future (Note: Both articles quote Keenan, a lecturer at Harvard University Graduate School of Design). 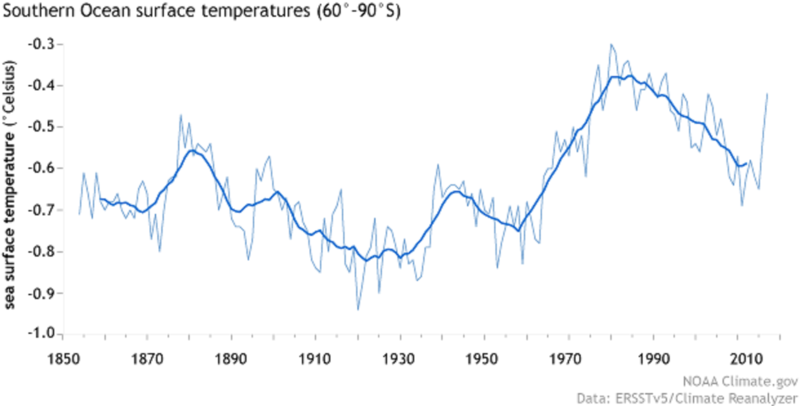 The Weather Channel article has a couple of nice charts (such as the one copied here) and both are a starting point for conversations about adapting to climate change. PS On a personal note, I lived in the Twin Ports (Duluth MN and Superior WI) for a couple of years around 2000. Beautiful place. How do we visualize changing temperature distributions? This recent video (3/29/19) by Robert Rohde shows how temperature distributions have changed. Each year the graph is a distribution of temperature anomalies. As noted “This essentially the same data that was previous shown as an animated map:” https://www.youtube.com/watch?v=JObGveVUz7k The video here is useful in any statistics or QL course and the two videos together provide an illustration of how to display data. The data is from Berkeley Earth. What is the state of Arctic Ice? 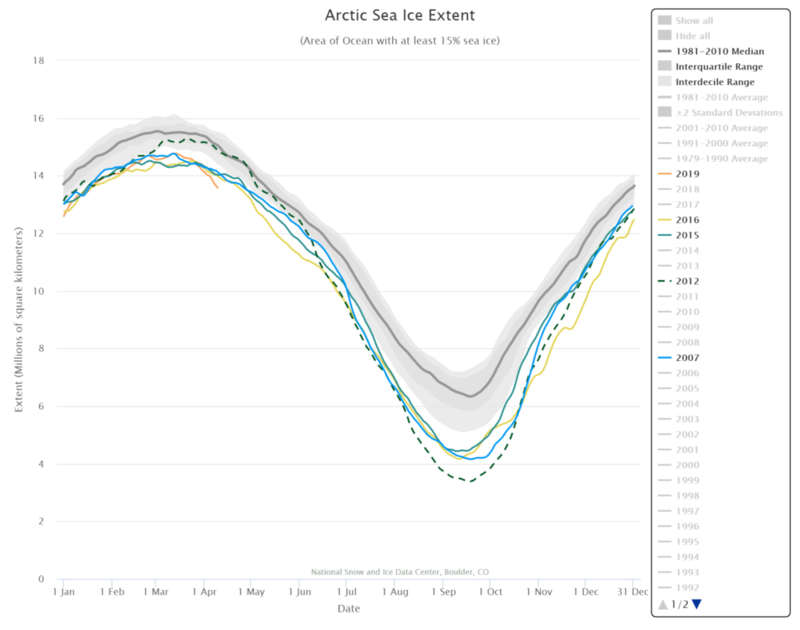 The melting season for Arctic Sea Ice has started with a quick drop in ice. The total ice is at a record low for this time of year (orange line in chart). But, how this plays out throughout the melting seasons is hard to predict based solely on past seasons. For instance, 2012 is the year of the record low (dashed line), but numerous seasons have been lower than 2012 at this time of year (2016 – yellow, 2015 – green, 2007 – blue shown here). Arctic Sea Ice extent is updated daily on the Charctic Interactive Sea Ice Graph by NSIDC. 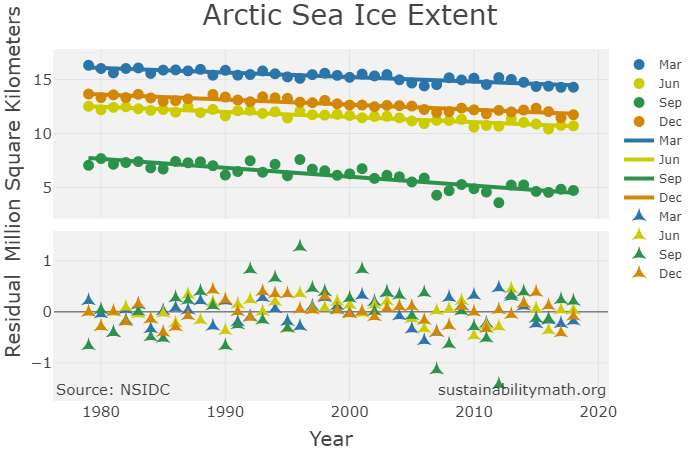 This graph allows the user to select years, download the image, and choose between Arctic and Antarctic ice extent. NSIDC posts the data and there is a project on both the Calculus and Statistics page using this data, as well as an interactive graph. There are three more interactive graphs on the Interactive Graphs page for a total of five. One is Arctic Sea Ice extent by year for the months of March (high month), June, September (low month), and December, along with regression lines and residual plots (snapshot here). The other two represent the expected years to live at a given age. One of these is by race and gender, while the other is all females and males. Both graphs include a regression line and residual plot. The purpose of these graphs is to not only be interesting and informative, but to also be useful as classroom resource for projects or exercises. 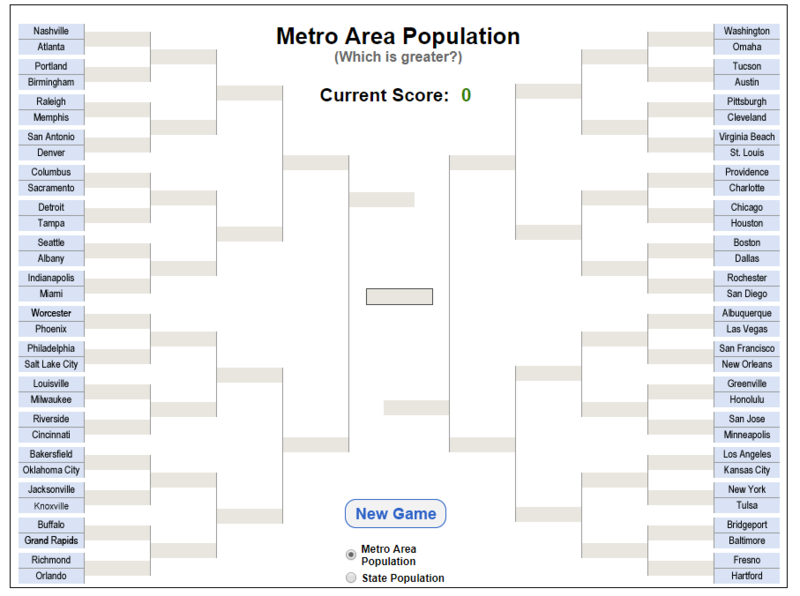 The Census Bureau has a new interactive data visualization called Population Bracketology (see the screen shot here). In the game, players have to choose the city (or state for the state version) with the largest population. Once the game is completed users can scroll over the cities (or states) to get the size of their population. So, how much do you know about city and state population sizes? Play the game and find out. How will raising the federal minimum wage impact workers? Raising the minimum wage to $15 by 2024 would undo the erosion of the value of the real minimum wage that began primarily in the 1980s. 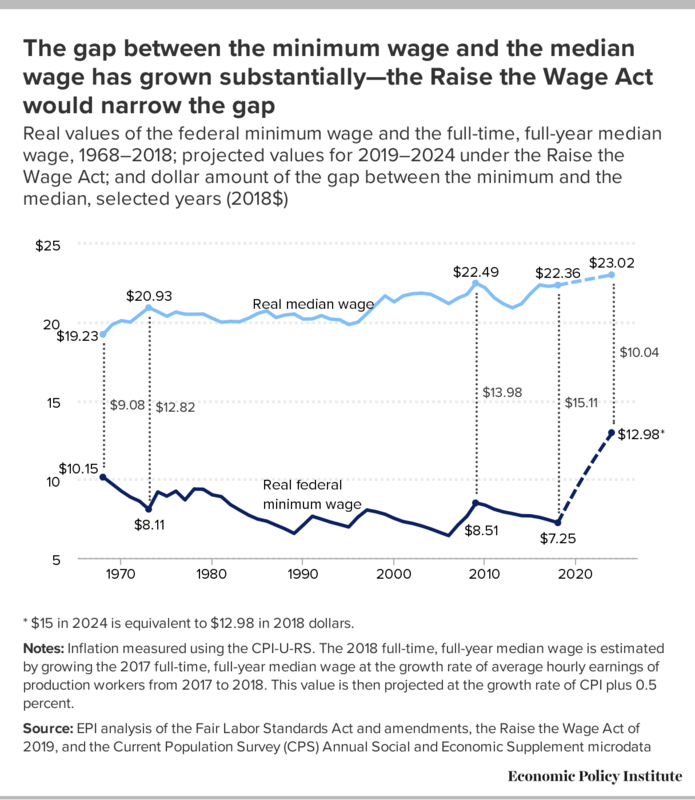 In fact, by 2021, for the first time in over 50 years, the federal minimum wage would exceed its historical inflation-adjusted high point, set in 1968. All told, raising the minimum wage to $15 by 2024 would directly or indirectly lift wages for 39.7 million workers, 26.6 percent of the wage-earning workforce. Indexing the minimum wage to the median wage would ensure that low-wage workers share in broad improvements in U.S. living standards and would prevent future growth in inequality between low- and middle-wage workers. Monthly average sea surface temperatures in the Southern Ocean around Antarctica from 1850–2017, based on NOAA’s ERSSTv5 data set. Analysis by Climate Reanalyzer, University of Maine Climate Change Institute. Thanks to thick ice, Antarctic elevation averages more than 6,000 feet (more than a mile above sea level). The very highest parts of the ice sheet, near the center of East Antarctica, rival the height of its tallest mountains, at nearly 13,500 feet. The Intergovernmental Panel on Climate Change (IPCC) synthesis report published in 2014 found a warming trend over Antarctica, but expressed low confidence that the warming was caused by human activities. In the late twentieth century, the ozone hole and its effects on air circulation may have partly shielded the continent from the global warming influence of greenhouse gas emissions. Continued success in addressing the ozone hole, along with fossil fuel emissions, may cause Antarctic temperatures to rise more rapidly in future decades. West of the Antarctic Peninsula, measurements dating back to the 1950s show a strong warming trend in the upper ocean: nearly 2.7°F. Meanwhile, waters of the Arctic Circumpolar Current (ACC), far below the surface, have warmed faster than the rest of the global ocean. Between depths of 1,000 and 3,000 feet, ACC temperatures rose by 0.11°F per decade between the 1960s and the 2000s. Between the 1980s and 2013, ACC temperatures at those depths rose by 0.16°F per decade. In contrast with the Arctic—where climate change is amplified, and sea ice shows a clear declining trend over time—Antarctic sea ice does not show a significant overall trend in either the summer or the winter. One region, south and west of the Antarctic Peninsula, has shown a persistent decline, but this trend is small relative to the high variability of the other Antarctic sea ice regions. In 2015, sea ice experts concluded that the small gains in Antarctic sea ice in some seasons were not enough to cancel out Arctic losses, and so globally, sea ice was declining. That basic conclusion remains true in early 2019. But what if all the ice on the continent melted? If the entire Antarctic Ice Sheet were to melt at once, it would raise global sea level more than 180 feet. Outside of an epic natural disaster such as an asteroid slamming into Antarctica, that ice sheet isn’t going to melt entirely for centuries, but it will contribute to sea level rise over the next century. The question is: How much? The exact answer is elusive. The IPCC Fifth Assessment Report (AR5) states that the effect of Antarctic ice sheets on sea level rise over the coming century is a major unknown. Not only is the ice sheet melt rate challenging to measure precisely, but other events could accelerate sea level rise, and it’s hard to know when or even if those events will occur. Read the article and get to know Antarctica. The is ample stats and QL classroom opportunities and graphs in the article. What are the gender trends in graduate school? Academic year 2016-17 marked the eighth consecutive year in which women earned the majority of degrees awarded at the doctoral level. Women earned 64.0% of graduate certificates awarded in 2016-17, 57.3% of master’s degrees, and 53.0% of doctorates. Among first-time U.S. citizens and permanent resident graduate students in the Fall of 2017, about 23.9% were underrepresented minorities, including American Indian/Alaska Native (0.5%), Black/African American (11.9%), Native Hawaiian/Other Pacific Islander (0.2%), and Hispanic/Latino (11.3%) (Table B.11). A summary page of the report, First-Time Enrollment Holds Steady – Application Counts Slightly Decline at U.S. Graduate Schools, also has a link to the full pdf report. What do SSPs have to do with modeling climate change? Global CO2 emissions (gigatonnes, GtCO2) for all IAM runs in the SSP database. 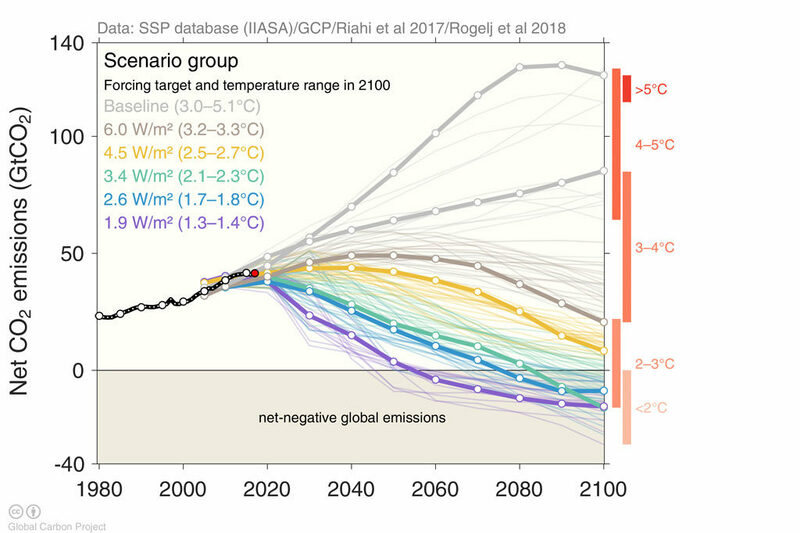 SSP no-climate-policy baseline scenarios are shown grey, while various mitigation targets are shown in colour. Bold lines indicate the subset of scenarios chosen as a focus for running CMIP6 climate model simulations. Chart produced for Carbon Brief by Glen Peters and Robbie Andrews from the Global Carbon Project. The SSPs feature multiple baseline worlds because underlying factors, such as population, technological, and economic growth, could lead to very different future emissions and warming outcomes, even without climate policy. They include: a world of sustainability-focused growth and equality (SSP1); a “middle of the road” world where trends broadly follow their historical patterns (SSP2); a fragmented world of “resurgent nationalism” (SSP3); a world of ever-increasing inequality (SSP4); and a world of rapid and unconstrained growth in economic output and energy use (SSP5). The graph copied here is the 5th in a series of 8 as the article explains the modeling process. The article is particularly useful for any course that discusses the modeling process. Most of the charts are interactive and there is also an animated graphic. There are links to data sources that requires setting up an (free) account. What are the differences in the college aspirations of teens? Girls are more likely than boys to say they plan to attend a four-year college (68% vs. 51%, respectively), and they’re also more likely to say they worry a lot about getting into the school of their choice (37% vs. 26%). Current patterns in college enrollment among 18- to 20-year-olds who are no longer in high school reflect these gender dynamics. 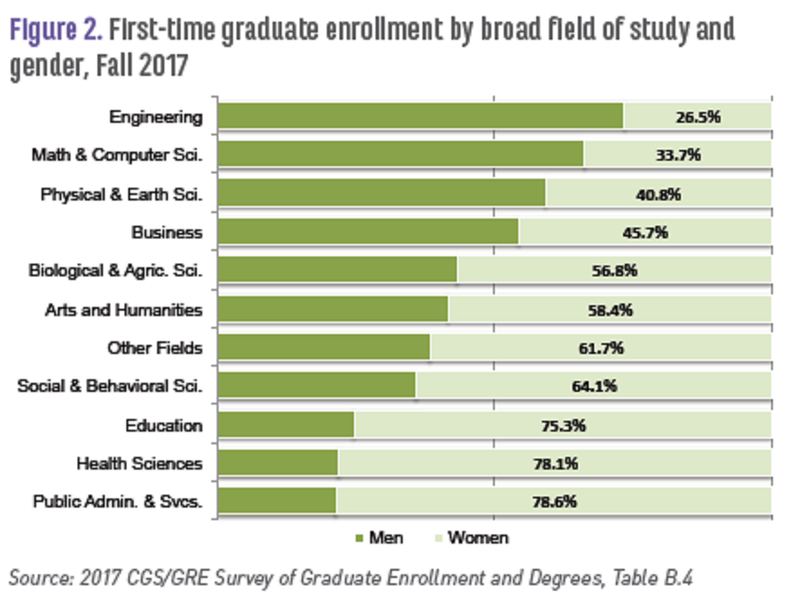 In 2017, 64% of women in this age group who were no longer in high school were enrolled in college (including two- and four-year colleges), compared with 55% of their male counterparts. Among teens with at least one parent with a bachelor’s degree or higher, as well as those in households with annual incomes of $75,000 or more, about seven-in-ten say they plan to attend a four-year college after high school. By comparison, about half of teens whose parents don’t have a bachelor’s degree or with household incomes below $75,000 say the same. The article has a number of other charts and a detailed methodology section (perfect for a stats course).